Are we doomed to have credit card debt? It is that time of the month again when all the bills start to come in. 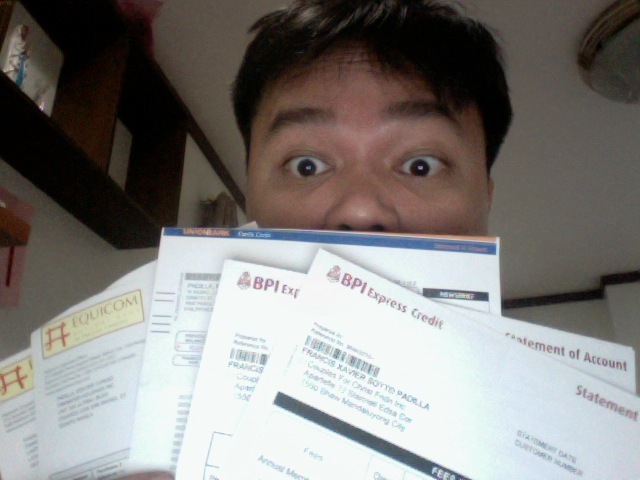 Is there a conspiracy in having all these bills arrive at the same time? Maybe so we won’t be in a bad mood the whole month? Just one half of the month? And with those electric, water, grocery and what-have-you bills, are the dreaded credit card bills. Are we doomed to always have credit card debt? I know a few people who have no credit cards debt because they have no credit cards. But how can you live without one? What about booking piso fares to places … just because they are on sale on Cebu Pacific? Or buying a nice dinner at a fancy french restaurant … just because it is on Deal Grocer? Or getting the newest iPad or gadget at zero percent interest… how can you not? Or buying a nice tall coffee blended drink at CBTL… well, because you are thirsty? Do we truly need a credit card? Why not just spend the money you actually have. Instead of spending money you THINK you have? Or HOPE to have? We sometimes look to our future money situations with very rose-colored glasses, that we end up paying only the minimum amount on our bills every month. And so the interest just keeps stacking and stacking – one month after another. Until you have a very, very, very long way down. I am trying to erase our debt. Painful process. Hiding the cards we have – or even cutting them. And just spending the money we have on hand. If we don’t have cash, then we don’t buy.